Self-care means paying attention to and supporting our physical, mental and spiritual health. It's a daily practice and one that's easy to dismiss in times of stress and busy schedules. It's so important to integrate into our routines in order to be present in our relationships, work, and purpose. Let's get a few things straight; self-care is not selfish and you can make time for it. We just need to step outside the cultural pressure to keep pushing ourselves, and start to listen to the physical and emotional needs of our mind, body and spirit. Because we all have different lifestyles, personalities, and priorities, self-care practices look different for everyone. Below is a short list of practices that I'm engaging in for self-love and nourishing this season. Maybe you'll try them with me? And let me know your favorite self-care practices in the comments below! Beginning the Day Technology Free: I wake up at 4:45 am Monday-Friday, and most days I have an urge to check email, read the NY times, scroll through Instagram etc. On the days I give in, I feel frantic from the get-go. Instead of beginning the morning with intention, I bring the chaos of the outer world into my inner world. I've started to set a second alarm that reminds me to not log in to accounts until it has gone off. My mornings are now limited (in the best way) to activities that feel nourishing. Practicing One Task at a Time: Anyone guilty of trying to do five things at once throughout the day? (Raising my hands!) I hold a false belief that I'm being more productive if I can learn to juggle. What actually ends up happening is my energy gets displaced and I accomplish fewer things. To battle the urge to do multiple things at once, I've started using Toggl to time my tasks, and only keep one tab open when I'm working on the computer. That way I'm not compelled to click on other websites and get off track. 2.) Yoga Nidra: Also known as "yogic sleep", this yoga practice is one of ultimate relaxation. It activates the parasympathetic nervous system, which allows the body to enter a state of blissful rest. 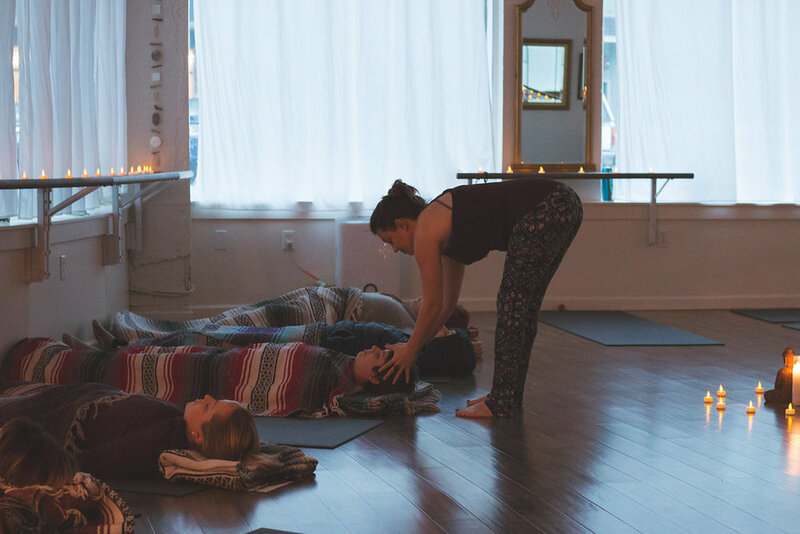 Practicing yoga nidra can help alleviate stress, anxiety and depression. It's incredibly accessible and a simple practice. If you have a floor to lie down on, and 5-10 minutes free in your schedule, you can start today! 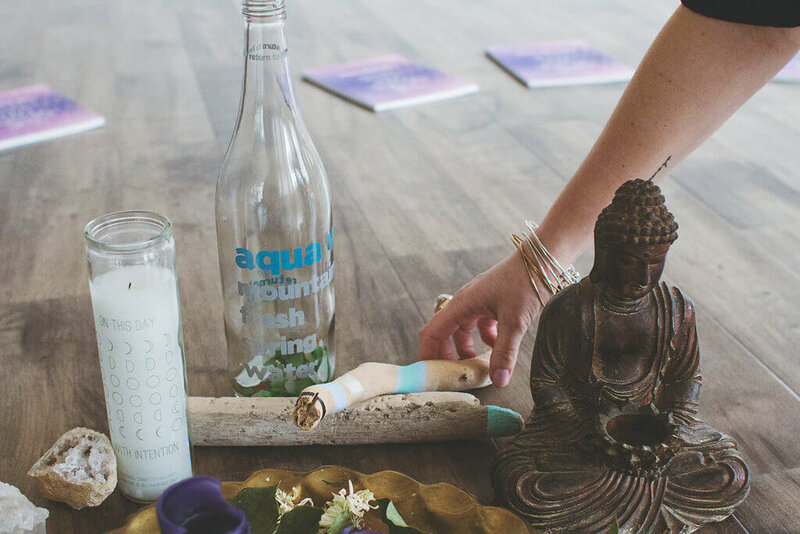 Click below for a free guided practice with yogi Elena Brower. 3.) Set Boundaries: Brene Brown says "daring to set boundaries is about having the courage to love ourselves, even when we risk disappointing others." Setting boundaries with your time, relationships, or work protects your vital energy. It's ok, more than ok, to say no to a request if it's going to compromise your energy. Be polite with the decline and trust that true friends will understand you love them, but are tending to your personal needs. 1.) Dry Brushing: Dry brushing is a great detox practice as it boosts circulation, sweeps away dead skin cells, stimulates the lymph nodes, and help the cells and body in general remove waste. It's energizing, so it's best to dry brush in the morning to get those benefits. Start at the feet and work up towards the heart, brushing for 3-5 minutes and shower off after your done. 2.) Keep Moving: Exercise boosts the mood, elevates our energy, and battles stress. Even with that knowledge, I lean towards sitting next to a space heater in my sweats all day during winter. I've been able to combat that heavy, discouraging feeling by maintaining my morning workouts. Part of my daily routine after waking up is to get caffeinated and start moving whether it's a swim, yoga practice or run. I know that I will feel better mentally and physically and the positive effects cascade into my day. 3.) Infrared Sauna Therapy: An infrared sauna is said to be 70% more effective than a dry sauna when it comes to expelling toxins. The major difference between the two is a dry sauna heats the air around you, while an infrared heats the body at a cellular level. Sounds scary but I promise it's not. A 45-minute sweat provides the benefits of improved circulation, skin rejuvenation, relaxation, decreased muscle tension. And honestly, it just feels good to be in a warm space when it's cold outside! 1.) Get Creative: Vision board, watercolor, pick up an instrument, daydream, knit, enroll in a drawing or cooking class, dance it out - do something that is not work-related or an obligation. I reject the idea that 'some people are creative and others aren't.' We are ALL creative beings. Use this time to find out how you want to express yourself. 2.) Read a Novel: Less than ideal weather keeping you inside? Instead of reaching for technology, how about settling down with a good book? If you're feeling really motivated, start a winter book club, complete with tasty snacks and some heart healthy wine. 3.) Stay in Touch with Friends (In Real Life): Busy and conflicting schedules make it easy to resort to texting or checking in with friends via social media. But real life connection has a lasting positive affect on the brain. Bonus points if you're getting outside during the visit. Get a group of your closest together for a hike or a weekend stroll through the farmers market. Your turn! What self-care practices are you currently engaging in? Or, what's holding you back from self-care. Leave your questions or comments below.